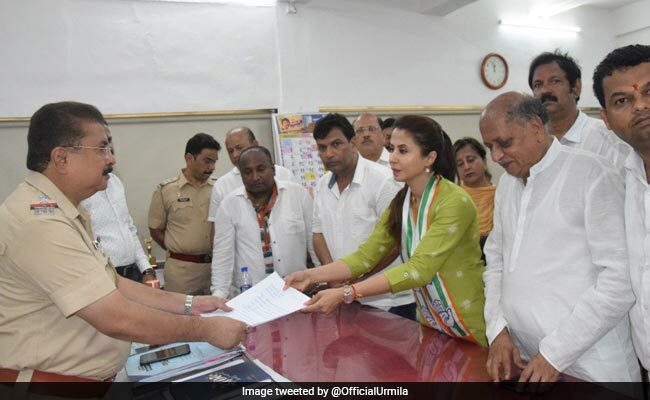 Actor-turned-politician Urmila Matondkar was granted police protection after a fight broke out between Congress and BJP supporters while she was campaigning at a coastal suburb in Mumbai today. Ms Matondkar, who is contesting the national elections on a Congress ticket from North Mumbai constituency, had sought police cover soon after the incident. "They are doing this to create fear. It's just the beginning and may take a violent turn. I have asked for police protection as there's a threat to my life. I've filed a complaint," Ms Matondkar had told news agency ANI then. Deputy Commissioner of Police (Zone XI) Sangramsinh Nishandar confirmed to news agency PTI that Ms Matondkar has been extended protection until the elections are over. However, he said there was no proof that those involved in the scuffle were BJP supporters, as claimed by the Congress candidate. "What we can say is that those involved in the incident were commuters," Mr Nishandar added. While she was campaigning outside Borivali railway station, some people allegedly started shouting "Modi, Modi" and confronted the Congress workers. Soon, it led to a fight between the two groups. "We were peacefully addressing people and from nowhere 15-20 people came and started shouting slogans. I didn't react to it and thought these things keep on happening and signaled them to let go," she told ANI. "But they all started vulgar dancing and using abusive language. They probably wanted to scare the women who were walking near us... Then a fight broke out and they even assaulted the women. From the first day I am saying their politics is of hatred... I won't let this happen in Mumbai." "Shocked at the blatant violation of code of conduct and hostile acts by BJP workers.. I was constrained to lodge police complaint for my own safety and to save the dignity of my female supporters," Ms Matondkar later tweeted. BJP has fielded its parliamentarian Gopal Shetty in North Mumbai constituency. He won by a margin of 4.5 lakh votes in 2014. Mr Shetty also claimed that the people who raised slogans were not BJP workers but commuters who support PM Modi. "The people have the right to campaign, just like the Congress and the BJP. What can we do if people who admire Modi raise slogans in his name?" he said. "You all know what happened at our programme. If they think, that because of all this, I will bend or lose or be scared, then they are absolutely wrong. With humility, I would like to remind these people that I am from the pristine land of Shivaji where women are respected. And I am not going to step back but march forward," Mr Gopal said. The BJP said it is also going to file a complaint against Ms Matondkar and the Congress workers with the Election Commission. "Railway passengers were chanting slogans of 'Modi Modi', following which Congress workers beat them up. One woman was beaten up. The BJP will file a complaint with the Election Commission. Urmila Matondkar should know that this is not a film set and there is no director, script and pre-decided lines. Things happen spontaneously in politics and those entering politics should know how to handle it," BJP minister Vinod Tawde said. Ms Matondkar, 45, joined the Congress last month. She said she was in it for the long-term and wanted to fight against the politics of hate. "I am taking my first step in active politics. I am from a family that has shaped my political views based on the ideology of Mahatma Gandhi, Jawaharlal Nehru and Sardar Patel. It is another matter that despite being from an academics-oriented family, I joined films. But I had social awareness right from childhood," the actor-turned-politician had said after joining the Congress. Mumbai's six Lok Sabha constituencies will vote on April 29 along with 17 others in Maharashtra in the fourth phase of polling for the national elections that started on April 11. Results will be out on May 23.